Title: PRESIDENT BUSH'S IRAQ FIASCO IS STEERING THE WORLD INTO A CONCRETE, COERCIVE UNITED NATIONS GOVERNMENT! "UN Secretary General, Kofi Annan, set up a committee of 'wise men and women' "
Today, as never before, the world is rushing into the arms of a global dictatorial government known as the United Nations! In the late 1980's, when I began studying the Illuminati Plan to gradually move the world into global government, the plans seemed so radical and so unlikely to be adopted by any government, let alone by all governments! Yet, today, these plans are being realized, one step at a time. Today, the question is no longer, "Will this plan succeed", but "When will this plan be completely fulfilled?" As you can see from this passage, the final 10 rulers of the earth shall pursue "one common policy" so that they can "deliver their power and authority to the beast." Since we know from Revelation 13 that the kingdom of Antichrist and his False Prophet shall be a global kingdom, we know that this common plan these final rulers are pursuing shall result in a global government, economy and religion. Once this global kingdom is established, these final rulers shall deliberately start a World War III, out of which Antichrist shall stride. NOTE: The world was silently reorganized into exactly 10 super nations, as we detail in CE1094 and NEWS1548. Thus, the first part of Revelation 17:12 is fulfilled, while we await the completion of the rest of the chapter! Now, let us examine Revelation 17:17, to gain more insight into this global plan. Therefore, the exciting fact about which Cutting Edge is continually speaking is that the Illuminati has long ago "agreed" upon a plan that will reorganize the world into a global government, economy, and religion and then stage their Antichrist -- just as Bible prophecy has foretold! FOLLOWING THE ESTABLISHED PLAN - IN YOUR DAILY NEWS! Now, this process is getting very far along, as the Daily News strongly reveals. Last September, we issued an article in which we postulated that President Bush and the United Nations had deliberately engaged one another in a Dialectic Struggle designed to impeach the concept that war can be started by the sovereign authority of individual states; once this impeaching process had run full course, the concept that only the United Nations had the authority to start a war would be permanently established. This article was NEWS1854, and is entitled, "PRESIDENT BUSH'S IRAQ FIASCO IS STRENGTHENING THE UNITED NATIONS!" If you have not read this article yet, we encourage you to do so now, for the plan we saw six months ago is now being boldly played out in the Daily News. Let us now review how far down the road this plan has come. We shall state the news and then the original plan. From Blix's statement, quoted above, you can see that the United Nations is beginning to assume the war-making functions of a sovereign state. When he says that "only the U.N. Security Council can dictate war, not individual states", he is presuming that the U.N. is the only sovereign state in the world. One of the major functions a sovereign state wields is the ability to declare war. When President Bush overrode the "will of the International Community" to order his forces to invade Iraq, he did so because he was exercising his sovereign authority. The U.N. protested the invasion, but did nothing to prevent it. Now that our invasion of Iraq has been proved to have been based upon fraudulent "intelligence data", the original "will of the International Community" is seen to have been correct all along. Just as we declared in NEWS1854. For many months from August, 2003, until just recently, Great Britain's Tony Blair seemed like a politician on the ropes. Parliament was angry enough that Coalition Forces had not found any Weapons of Mass Destruction in Iraq that it created the "Lord Hutton" investigative committee. After months of investigation, Lord Hutton issued a report blaming BBC News for fomenting unease over the Iraq War, surprisingly exonerating Blair of the charge of deliberately lying. "To President Bush's doctrine of pre-emptive action, we now have to add British Prime Minister Tony Blair's doctrine of 'international community'.This is a kind of half-way house between the freedom of action Mr Bush seeks to preserve and the rules of the United Nations Charter which allow intervention only in certain circumstances, such as reversing an act of aggression ... the old rules are already under strain ..."
The "old rules" referred to here is the honored system of individual state sovereignty. The Illuminati has continually kept up the drumbeat that World Wars I and II were caused by nations exercising their sovereignty; conversely, stated opinion is that these wars would not have been started had the United Nations been the only sovereign entity in the world! Let us now go back to this BBC article to see how steadily recent events have been carried out that erode confidence in traditional nation-state sovereignty. "Nato's attack on Serbia over Kosovo in 1999 established the rule of a humanitarian intervention. It followed the worldwide guilt felt at the failure by the UN, or anyone else, to intervene in Rwanda. Now Mr Blair wants to take the process further. International terrorism post-11 September and the spread of weapons of mass destruction require a further redefinition of the rights of a nation-state ... He even mentioned the Treaty of Westphalia in 1648. That basically ended the religious wars in Europe and began the modern system of the nation-state, whose rights, he suggested, should be further curtailed." Did you catch that statement? Prime Minister Tony Blair is advocating that the United Nations should "further curtail" the rights of individual nation-states! Please carefully consider the full ramifications of this statement, for they go well beyond just the inherent authority to wage war. This disaster means that all our laws passed by our state and national legislatures will be overridden by United Nations laws. This fact means that our court systems will be subject to the International Court of Justice in The Hague. This means that our laws based upon Judeo-Christian values will be subject to the increasingly occult, Mother Earth, and Eastern Mysticism religions dominating the "International Community". Every facet of our society -- including State and Local police departments -- will be controlled by the United Nations! Our Founding Fathers realized that our rights as citizens could only be protected by naturally-born citizen leaders who focussed on taking action which would benefit and protect our narrow national interest. Our Forefathers realized that international control inevitably leads to harsh dictatorship. However, our elected Illuminist leaders for nearly 100 years have consistently taken action to gradually transfer our authority and sovereignty to the United Nations. We are nearing the end of this most bitter of fruits. "Meanwhile, the UN itself is also trying to redefine intervention. Last September, the UN Secretary General, Kofi Annan, set up a committee of 'wise men and women' to make recommendations about the UN's future role." "Wise Persons" is a term originally coined over 50 years ago. This term literally means that the government of the world should be guided by "Wise Persons", wise in the opinion of United Nations leaders! We are not talking about men "Wise" in the Biblical sense, for the Illuminati has always hated Christianity and its eternal Bible. 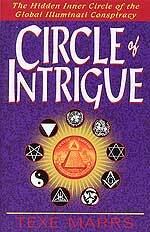 No, we are talking about "Wise Illuminists" who have gained their wisdom through proceeding through the occult arts, the ways of that secret society -- the House of Theosophy -- which we have quoted above. These "Wise Men" believe that Christianity is just one religion, no greater or more valuable that Buddhism, for example. Jesus and The Buddha are just equal Avatars -- World Teachers! Thus, in the combined effort to achieve the One World Government, Economy, and Religion, The Buddha will provide the Wisdom (Light) while The Christ (Jesus) will provide the Love. Therefore, these "Wise Persons" which Kofi Annan has appointed shall be trained according to the "Wisdom" of The Buddha! Who is this "Christ"? He is none other than the Illuminist Masonic Christ, whom the Bible calls Antichrist! "... only the U.N. Security Council can dictate war, not individual states." When a government gains the power to wage war, that government gains all lesser powers as well. 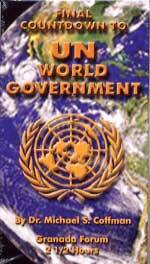 The United Nations is on track to usurp all power and authority from all governments in the world. How soon will we get there? In NEWS1900, we showed that Illuminist states such as the United States, the European Union, Australia, Indonesia, and Thailand are actively invading or threatening to invade "Non-Integrating States" within their assigned region, in order to force them to rapidly make the necessary changes that would allow them to participate in the kind of world system whereby all people will "buy or sell" using an implantable microchip. We said in this article that we can possibly gauge the time when the global system will be established by watching how quickly these states are converted into "Core States". Not only has this type of short, deadly war "not been ruled out", it has been incorporated into the planned World War III. 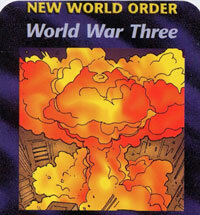 So well known was the plan to stage a World War III that Steve Jackson included a "World War Three" card in his Illuminati Card Game [Read NEWS1857 for full details as well as a listing of all other articles explaining this card game and showing representative cards]. It may be part of the plan that the really backward nations whose entry into the "Functioning Core" of the global community is many decades away might be annihilated when the Weapons of Mass Destruction begin to fall during the world war designed to produce Antichrist. In fact, I strongly suspect this is the case. Just as we postulated last September, in NEWS1854, President Bush's disastrous invasion of Iraq is moving the world closer to the day when individual nation-states will no longer possess the capability to wage war or of making any other sovereign decision, for that authority will have been passed to the United Nations. As we stated during the time we were launching the Iraq War (March-April, 2003), a successful war campaign with little or no downside effects would strengthen the concept of national sovereignty. Since the Illuminati waged World Wars I and II for the express purpose of establishing a global government which would one day take over all sovereignty formerly held by individual nations, it seemed to us that the broad-picture plan called for the Iraq War to turn disastrous. Most responsible observers know agree that "disaster", or "fiasco" or "messy" applies to our current situation in Iraq. While we have won the war, we have not won a peace. Insurgent and suicide attacks are being daily unleashed at both Coalition Forces soldiers and Iraqi civilians cooperating with us. Civil War is a very definite possibility. Meanwhile, Muslim anger against the United States for our attack on a country who really did not possess Weapons of Mass Destruction continues to rise and continues to threaten Israel. Out of this planned chaos, the sentiment is emerging that the day of "nation-state sovereignty" needs to end. This is the end goal and statements like those of Blix and Blair are leading us there. The only domestic question for America seems to be which President would be most able to lead America into her final surrender of sovereignty: Bush or Kerry? 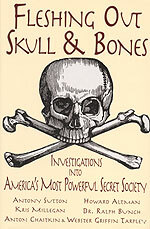 Both men are Skull and Bones Adepts, so either of them could be counted upon to faithfully lead us up the ramp into sovereignty surrender. Would the architect of our failed Iraq policy -- President Bush -- be the best one to lead us up that ramp? Or, would Democrat Kerry be the best leader for this purpose? He could constantly point back to the disastrous policies of Bush to garner the support for such a move. Such a surrender could be thought of as domestic policy. Since the Illuminati causes a Democrat to come into power when they want a domestic agenda pursued, Kerry might be the next President. However, both the Bible and the Plan of the Great White Brotherhood calls for a World War III to be the "final birth sorrows" (Matthew 24:8) which will produce Antichrist. This "deadly but short global war" is an exercise in foreign policy. A Republican President is brought to office when the agenda is foreign policy. We shall just have to wait to see how and when the final events drop into place. However, we are close enough now to see the public pronouncements that are the outworking of plans over 60 years old! Truly, the End of the Age is upon us.